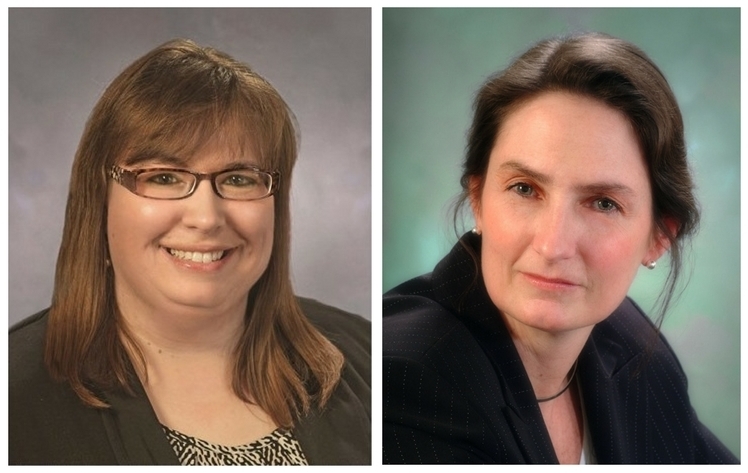 North Adams, MA – Kelli Kozak has been promoted to Vice President, Community Engagement, and Stephanie Scott has been promoted to Vice President, BSA & Deposit Compliance Officer, according to an announcement by Lynne Carlotto, Executive Vice President & Senior Risk Management Officer at MountainOne. Kelli Kozak originally joined MountainOne in 2006, and has served in roles of increasing responsibility, including Assistant Vice President of Community Engagement and of Community Development, as well as Executive Administrator, Clerk of the Corporation. In her new role, she manages MountainOne’s Community Dividend donations program. She also oversees the corporate volunteer program, community relations, and special events. Additionally, she coordinates documentation and analysis in support of federal regulatory compliance with the Community Reinvestment Act (CRA). Kozak holds a Bachelor’s degree from Skidmore College in New York. She is active in the local community and serves as Chairperson for the Board of Directors of the North Adams Maker’s Mill Makerspace, Vice-Chairperson for the Board of Directors of Berkshire Family and Individual Resources (BFAIR), serves as an allocations panelist for the Northern Berkshire United Way, as a volunteer at BART Charter Public School, and as a member of both the Northern Berkshire Housing & Homelessness Collaborative and the Berkshire Funders Roundtable. At MountainOne, Kozak co-chairs the CRA Committee and the Loan Opportunity Task Force, and chairs the Community Dividend Review Committee. She lives in Cheshire with her husband, Brad, and their two sons. Stephanie Scott originally joined MountainOne in 1999, bringing with her over 15 years of banking and insurance experience. Within MountainOne, she has previously held the roles of Chief Compliance Officer of the Broker/Dealer and Registered Investment Advisory Firm, Financial and Operations Principal for the Broker/Dealer, Operations Manager & Compliance Officer for MountainOne’s group benefits subsidiary and she also served as a designated Supervising Principal for Commonwealth Financial Network for seven years. Her most recent position was as a Fraud & Risk Analyst Officer for MountainOne’s Risk Management division. For many years, Scott successfully maintained multiple securities registrations and insurance licenses necessary for her complex roles. In her past positions, based on her management of regulatory exams and audits, she has been invited to meet with national officials to share views on regulatory issues, and is also a past presenter for Mass Bankers on the topic of Broker-Dealer Best Practices in the Sale of Variable Annuities. In the community, Scott has been a longtime volunteer with Northern Berkshire United Way, currently serving on the Allocations Committee. She lives in Williamstown with her husband, Rich Alley, and has an adult son. MountainOne is a mutual holding company headquartered in North Adams, MA. Founded in 1848, MountainOne Bank has assets of approximately $875 million, and provides a complete array of personal and business banking and electronic services. MountainOne Insurance provides personal and business insurance, bonding services and group benefits solutions. MountainOne Investments provides investment advisory services and products to individuals and businesses (financial professionals offering securities and advisory services through Commonwealth Financial Network®, Member FINRA/SIPC, a Registered Investment Advisor). Products and services are offered at full service offices in the Berkshires (Pittsfield, North Adams, Williamstown) and on Boston’s South Shore (Quincy, Rockland, Scituate).